As just about anyone who knows me personally (and I mean, spent at least five minutes talking to me), I’m Greek on my mom’s side and I attend the Greek Orthodox Church here in San Antonio. My church had their 52nd Annual Greek FUNstival this past weekend and I am not even exaggerating when I say it’s my favorite weekend of the year. I’ve never missed a weekend in the last 17 years (oh geez, I feel old) and I have participated in the folk dance group almost as long, although I do consider myself retired now. It’s a crazy three day blur of music and food and hanging out with some of my closest and oldest friends. This year, literally everyone I invited decided to attend FUNstival on Friday night, which worked out great in that I knew I was going to miss most of Saturday (that’s coming up in the next post). I took the opportunity to get really dolled up, because I knew I’d be out for most of the night! The bronzer I used on my legs is coming up in another post! I kept the wedges on for a few hours and then changed into flats so I could start Greek dancing with my friends! It was a crazy fun night and thanks to everyone who came out! So now, let’s take a transition and check out my makeup after the jump. Sorry it’s a little blurry, I was in a rush. I can see that the left lash strip is a little wonky. Oops! 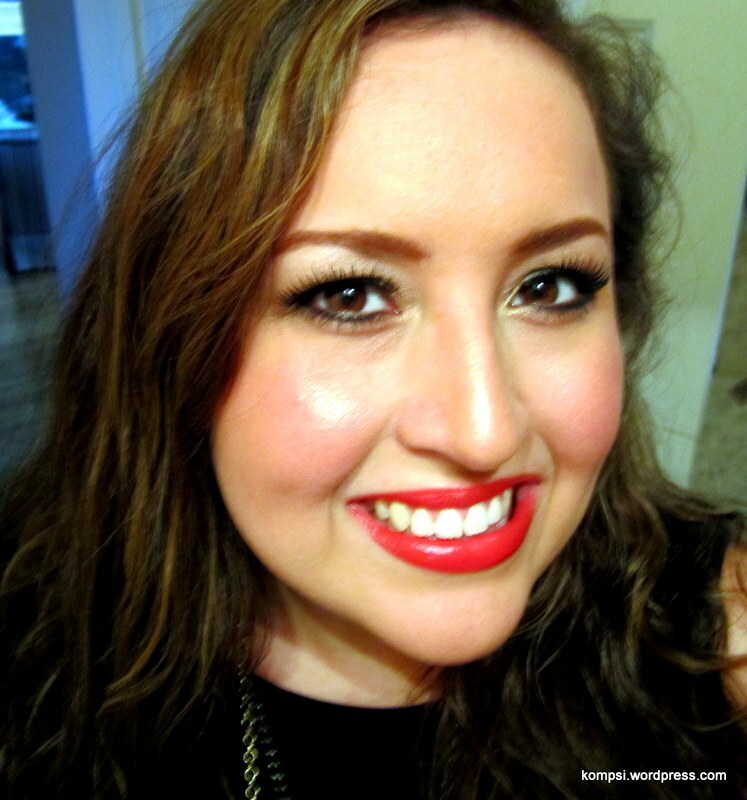 I honestly can’t remember exactly what I used, but it was definitely a light, beige blush, lots of bronzer, gold and dark bronze eyeshadows from Urban Decay’s Naked palette, falsie eyelashes by Katy Perry and Revlon’s Fire & Ice lipstick. A word of advice about false eyelashes: the glue provided is usually crappy, spend the extra $5 and get a good one. I picked up this brush on lash adhesive at HEB the other day and it’s great because you can control the amount of glue you’re putting on the strip, as opposed to a big glob spurting out on one end. Also, staying power was AWESOME considering my eyes get irritated and teared up by just about everything, and the lashes stayed on all night. Seriously, I did my makeup around 5 pm and got home about 2:30 am. 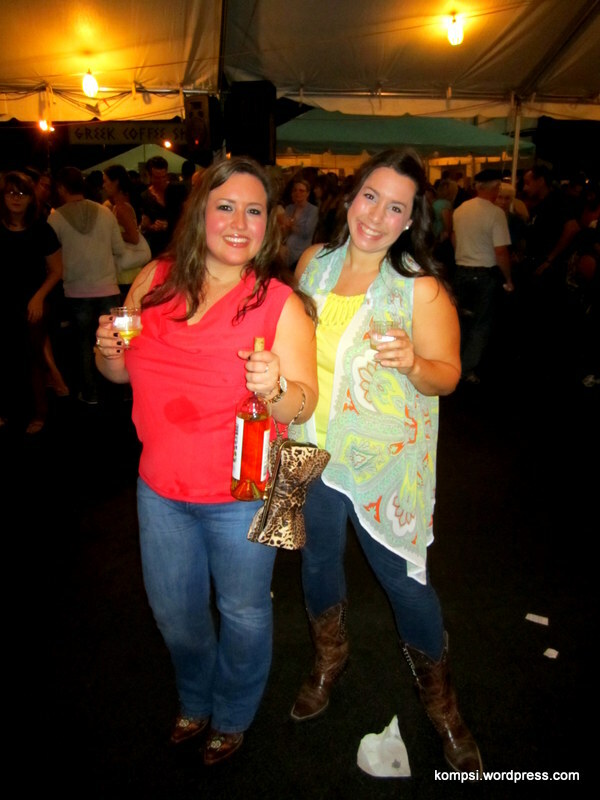 As a bonus, here’s me and my bestie Amanda at the Houston Greek Festival earlier this month! We had a blast!